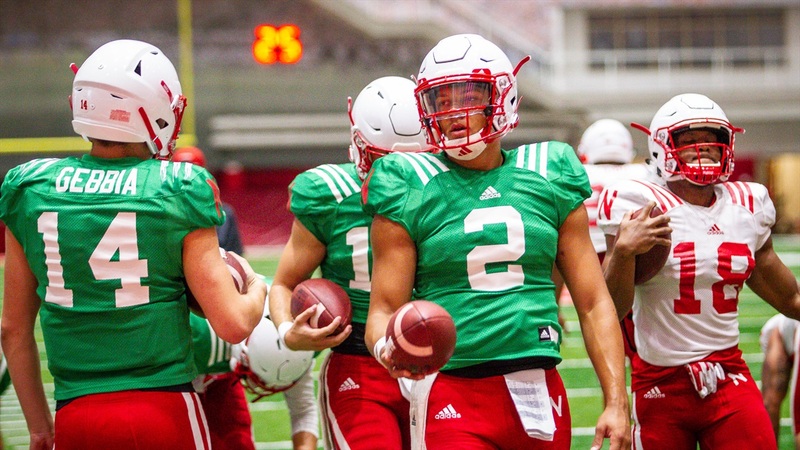 The quarterback race is the hottest topic in Nebraska, and with two weeks to go before the season opener and another practice scrimmage in the books, we should be closing in on decision time for Scott Frost. Last season, there was a battle for the starting quarterback job as well between veteran transfer Tanner Lee and redshirt freshman Patrick O’Brien, although with open practices, it was pretty clear to the media that O’Brien was closer to true freshman Tristan Gebbia than he was to Lee, the presumed starter heading into the competition. This season is completely different. First of all, neither of the competitors — Gebbia and true freshman Adrian Martinez — has taken a single snap in a college football game. Also, the media has gotten to see a grand total of about an hour of practice this fall. It’s pretty difficult to get a feel for how things are going when we only get to see some warm-up passer drills and walk-throughs. The only real data point fans and media alike have is the spring game, in which Martinez dazzled with his legs in his Husker debut while Gebbia looked merely solid. In the absence of new data, media, radio hosts and fans have hit on the same talking points over and over again. It seems like Martinez has taken the lead in the minds many for a variety of reasons. One point I keep hearing is that Frost called Martinez his “favorite guy in the country” when the quarterback from Fresno, California, signed with Nebraska in December. Frost offered Martinez on the same day that he officially accepted the job at Nebraska. He was very clearly a huge priority for Frost and his staff once they made the leap from Central Florida and the American Athletic Conference to Nebraska and the Big Ten. On the other hand, Frost inherited Gebbia, who was recruited to play in a completely different offense. Frost is going to want “his guy” under center, right? That’s not necessarily the case. In his first year at Central Florida, Frost gave his two seniors — Justin Holman and Nick Patti — first crack. However, after some less-than-stellar play and an injury to Holman, Frost gave true freshman McKenzie Milton a chance to start and then stuck with him the rest of the way. Nebraska doesn’t have a returning starter like Holman, so the comparison isn’t apples to apples, but it does show that he's not going to force “his guy” into the role immediately. It seems like he’s approaching the decision with a completely open mind. If there is an experience edge, it certainly goes to Gebbia. He’s gone through two springs and spent a season on the scout team at Nebraska. He and Martinez have spent the same amount of time learning Frost’s offense, so that’s a draw, but that extra time to acclimate to college life and college football does matter. On the other hand, Martinez didn’t even get to play his senior year of high school because of a shoulder injury. As recently as the spring, Frost said he didn’t think Martinez’s arm was back to full strength. Enrolling for spring ball certainly helped ease the transition, but playing quarterback at the major college level as a true freshman is a difficult proposition for anyone. However, Martinez was Frost’s favorite quarterback prospect for a reason — his skill set seems reminiscent of quarterbacks who have succeeded under Frost in the past, such as Marcus Mariota and Milton. Martinez rushed for 60 yards and three touchdowns in the spring game, showcasing dynamism as a runner that Gebbia simply can’t match. That being said, Gebbia did show the ability to be a very functional runner in his days at Calabasas and Frost said the key is to be able to make solid gains when it’s time to run as opposed to needing the capability to rip off a huge gain every time. While physical speed is certainly important in Frost’s up-tempo offense, mental quickness is just as important if not more crucial. Quick reads and accurate passes are the key to moving the ball with the pace that Frost desires, and those are two traits Gebbia has drawn praise for in the past. He spread the ball around to a number of talented receivers in high school, leading a high-powered offense that put up some pretty gaudy yardage and point totals. Martinez, on the other hand, has missed out on so much valuable development time at a crucial point in his career. He’s a bit more of a wildcard in this area. There isn’t going to be much of a present versus future discussion here considering both players are freshmen. It’s going to come down to one factor: which player gives the Huskers the best chance to win? Which one gives the offense its best chance of operating the the level Frost envisions? Which one has produced more consistently from start to finish in fall camp? We can’t hope to answer that considering, again, we haven’t seen those practices. In the spring game — against a vanilla defense consisting of mostly of reserve defenders who weren’t allowed to hit the quarterback — the answer was Martinez. Personally, I said heading into the battle that I thought Gebbia would be the opening day starter. I haven’t seen enough to change that opinion because I’m not going to overreact to a single practice scrimmage. However, if Martinez does manage to overcome everything that is stacked against him and win the starting quarterback job from day one, fans should probably get even more excited than they already have been about what the next few ears might hold. In the short-term, even Milton was pretty mediocre as a true freshman. But Frost stuck with him and was rewarded as he developed into one of the best quarterbacks in the country as a sophomore. Could we see something similar in Lincoln? Perhaps. We’ll find out sometime in the next couple of weeks. Sept. 1 can’t get here quickly enough.